26 percent of an airlines personnel are engaged in the maintenance of their aircraft. Trying to keep the airlines aircraft fleet in a flying condition was a herculean task. The mechanics and specialist who maintain the fleet had to meet exacting standards. Safety in flight is dependent not only on the flight crew, but also those ground crew who keep the aircraft mechanically fit. The flight crew’s only way of knowing the airworthiness of their aircraft is to check for the signatures and work sheets, and inspection forms of every aircraft. Maintenance plays a major role in the routing of aircraft so that each and every plane will receive its routine maintenance and its periodic inspections at each an every stop. These inspections which progressively cover every aircraft part, system, component and accessory in the life of the plane between its major overhaul periods call for an intricate planning and the provisioning of adequate parts through out the airlines system. 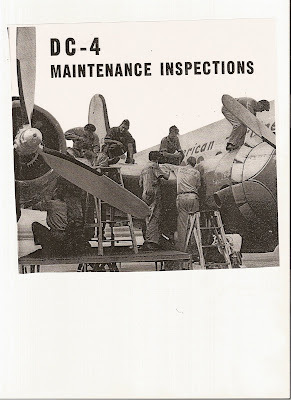 During the 1940-50 American Airlines had five class 1 or major stations for the performance of major repair work and inspections. They were located at Tulsa, Chicago, Los Angeles, Fort Worth, and New York. They had 15 class ll stations where terminating checks, pre flight checks and minor repairs were executed. In 1947 American Airlines occupied three hangars with shop facilities at La Guardia Field, New York. 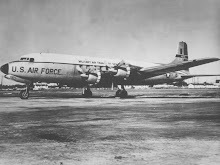 They could conduct base maintenance on DC-3 and DC-4 aircraft. 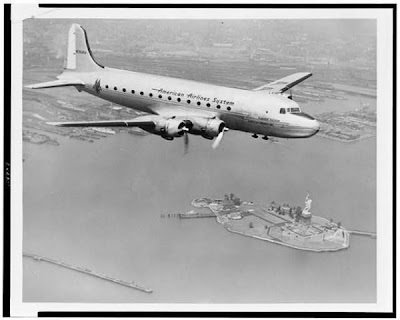 They included major inspections, major repairs, overhauling accessories, propellers, instruments, radio and electrical changes for DC-3 aircraft equipped with Pratt& Whitney 1830 engines. They also include all DC-4 engine changes. They also stocked parts for all their DC-4 aircraft. Similar hangars were equipped at Fort Worth and Tulsa. The routing of all company aircraft throughout the entire airline system so that each plane will arrive, in accordance with predetermined schedules, at precisely the right station and at the right time for the right periodic inspection or overhaul, as it falls due, is a job that requires meticulous attention to a multitude of details. Flight terminations must be staggered to avoid having aircraft off schedule awaiting maintenance at work stations. A plane due for an engine change must be routed through to a station that is equipped to perform the change. Planes must be made available for crew training, spares, extra sections to meet peak loads, engineering tests, modifications etc. These and many more considerations must all be taken into account and molded together so there will be no conflict with or disruption flight arrival and departure times. These activities were the responsibility of the aircraft routing control office. And imagine they did this with out the use of computers! They were highly skilled personnel who manually prepared the routing charts for each type of equipment taking into account the most effective utilization of both the shop facilities and the aircraft. The charts they prepared presented complete routings for each aircraft through the airlines system. 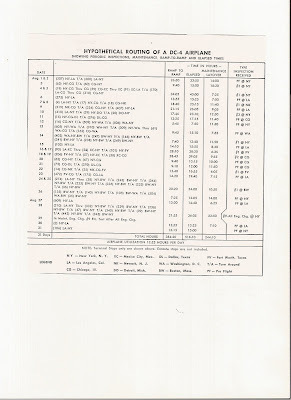 The charts included the assignment of aircraft by stations, with the number scheduled in reserve, undergoing maintenance, engine changes or modifications. Also, hours scheduled daily by routes with organizations and terminations and monthly totals for the planes actual hours flown. Once again we must remember they did this without the use of computers! Posted on large control boards was the vital information presenting at a glance a complete picture of the maintenance schedules for the entire fleet. The work to be done, work scheduled for different stations etc. On aircraft status boards are recorded the actual accomplishment for each day. PERFORMED AT EACH SCHEDULED STOP WHERE THE AIRLINE’S MECHANICS ARE AVAIALBLE. To replenish the supply of fuel, oil, alcohol, or hydraulic fluid as required. To do any maintenance work necessary to make the ship airworthy. 1. Install tail post, main gear blocks, and nose gear safety pin wheel blocks and battery cart immediately after the propellers have stopped turning. 2. Check pilot complaints; correct those which in the opinion of the supervisor affect the airworthiness of the aircraft. And sign forms. 3. Stick check the quantity of the gasoline determine the fuel load, and check the quantity of oil in the tank. 4. Check quantity of hydraulic fluid in the main and aux tanks. 5. Perform a walk around inspection of the aircraft using the following guide. A. Visually inspect both wings for general condition of the skin surface de-ices and aileron control surfaces. B. Visually inspect each engine for hyd, oil or fuel leaks, Birds, paper etc lodged in the air scoops, nicks on the props or anti icer feed shoes. C. Visually check left wheel and gear for general condition, also strut. D. Visually check nose wheel and gear for general condition also strut. F. Check each flap for damage. G. Check fuselage skin for signs of damage. H. Check the tail group for general condition and signs of damage. 1. Perform visual pre departure check of the airplane using the following as a guide. C. Plug battery cart in and position clear of the props. D. Remove all ground equipment and close cabin doors. F. Ship clear, start engines. H. Remove gear blocks, and nose gear pin. Tag on Photo to enlarge. This particular aircraft during the last month, 31 days chalked up 244.10 hours of maintenance layover time, 384.20 hours of ramp to ramp time and 518.10 hours total elapsed time resulting in 12.23 hours per day utilization. During this period it was routed throughout 27 stations from coast to coast, and into Mexico visiting each the following number of times; New York 31, Los Angeles 8, Chicago 15, Mexico City 3, Newark, 2 Detroit 2, Dallas 15, Washington 19, Boston 13, Nashville 4, Little rock 2, Oklahoma City 6, Cincinnati 4, Indianapolis 2, St. Louis 10, San Antonio 3, Monterey 5, El Paso 4, Tucson 3, Phoenix 3, Tulsa 10, Buffalo 3, Philadelphia 2, Memphis 3, Knoxville 1, San Diego 1, and Fort Worth 2. It received 151 Service inspections, (one at each station where no other inspection was given), 14 Pre Flight Inspections, 6 No. 1 periodic inspections, 3 No. 2 periodic inspections 1 No. 3 inspection and 1 No. 9 inspection with all engines changed. That’s a total of 176 maintenance inspections during a single month of operation of which 14 were pre flight inspections and 11 were periodic inspections. This is but a single example of the maintenance work done on a single ship in a comparatively short period. When one considers that a similar work is at the same time being carried out on every other aircraft in the airlines fleet according to its position in the maintenance cycle some realization is had of the tremendous job that maintenance must perform in keeping every plane airworthy and in perfect mechanical condition. Also the major role it plays in contributing to the safety of scheduled air transportation. Genial brief and this enter helped me alot in my college assignement. Thanks you as your information. hey, great blog! i was wondering if you know where i can find a hangar in ny or nj area with old cargo planes, any ideas? email me at karlalim2@yahoo.com if you do pls! would much appreciate it! thanks!